Treasure of the Forgotten City is a 4th Grade novel and even though I am much older than that I loved it all the same. Three priceless star jewels. A century-old, cryptic journal. Using only the resources left by your grand-uncle, it’s up to you to find Atraharsis — the legendary lost city beneath the sands. But the way won’t be easy. Raging sandstorms, sinister traps, and a whole host of mysteries stand between you and your Ultimate goal. Can you solve the riddles, and recover the fabled star gems in time? Or will you — like so many who’ve gone before — become the next permanent resident of the forgotten city? 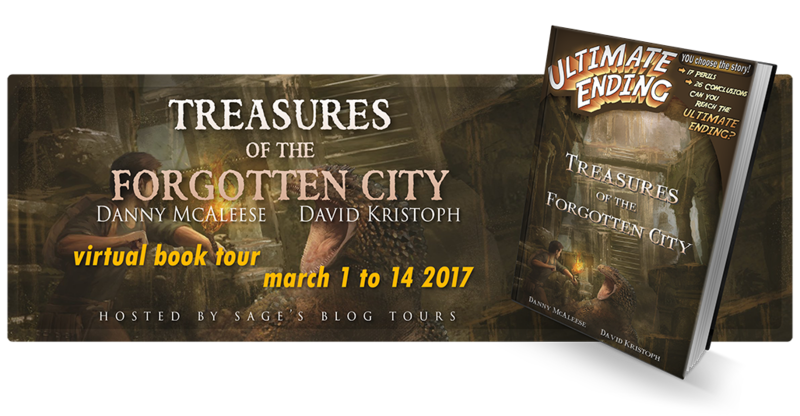 I give Treasures of the Forgotten City by Danny McAleese & David Kristoph four out of five hears! I loved it, but it could have had a bit more development. This might also could just been a flaw in the way the story is told. So it is almost a 4,5 hearts. I just do not have half a heart. 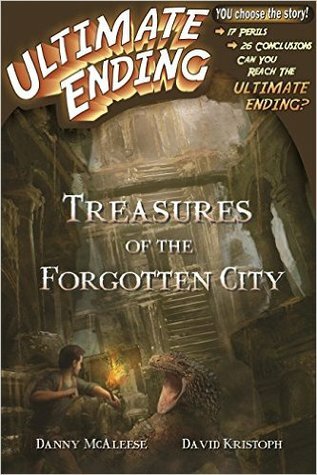 Treasures of the Forgotten City is a choose your own story with only one Ultimate Ending, but about 25 others. Some of them bad, some of the good. And I got to do a couple of them, failing at my mission but also succeeding a couple of times. Just never the ultimate ending, I might still try a couple of times, because it was really a lot of fun. I have always loved reading and especially when I could make the story mine (that is probably why I like writing too), having it go where I want to go. These kinds of stories are always a lot of fun. The main character is YOU, the reader. This is not something I have encountered all that much. I liked it because it gave me a change to explore a novel from a different pov. Although you are a certain person, a young man named Donovan Young. And so the first “chapter” is explaining who you are and how you ended up where you are at the start of the novel. It works really well for Treasures. The story is fast paced and on all most every page there is a choice to be made. It really keeps the attention on the story and moving onward towards getting to that ultimate goal. I think even the most unwilling child could get captivated by this book. This review is part of a blog tour, hosted by Sage’s Blog Tours. This entry was posted in Book Review and tagged Adventure, Blogtour, Book Review, Danny McAleese, David Kristoph, Drama, Fantasy, Mystery. Bookmark the permalink.